Renowned veterinarian, author, and celebrity spokesperson Karen “Doc” Halligan has developed a distinguished veterinary medical career while establishing herself as a national authority on animals. She was a sought-after pet health expert and featured spokesperson in the media during the pet-food recall crisis and provided veterinary care at ground zero in Louisiana in the aftermath of Hurricane Katrina and in Texas following Hurricane Harvey. In addition to being a skilled surgeon in spay/neuter techniques; she was the director of veterinary services for the spcaLA for over twelve years and is an expert in animal-cruelty, having prepared in excess of over one hundred cases for trial as well as testifying as an expert witness. Additionally, she has presented lectures to law enforcement on the successful use of forensics in animal cruelty prosecution. For the past five years, she has served on the board of directors of the American Red Cross of Santa Monica where she helped developed emergency service protocols for pet owners that can serve as a national model. A native of San Diego, Calif., she double-majored in theater and zoology while performing in animal shows at the San Diego Zoo. 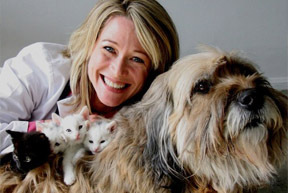 In 1989, after graduating from the University of California, Davis, Doc became acutely aware of the tremendous pet overpopulation problem and seeking to give a voice to animals and help pet parents everywhere, she moved to Los Angeles in 1993 and began to passionately lobby on animal- welfare issues. She currently oversees all aspects of The Lucy Pet Foundation whose mission is to reduce pet overpopulation by supporting mobile spay/neuter clinics across the country and to support causes that benefit animal welfare. She also practices general medicine and surgery at Marina Veterinary Center in Westchester and shares her life in Marina Del Rey with Ricky, Ethel, and Nathan, three very spoiled and healthy cats! You can learn more about “Doc” Halligan at her website www.dochalligan.com.